Ghaziabad (Delhi NCR) / MMI IV (Light shaking): Felt around 1:46am(Nov 12, 2013) like a jackhammer vibration and i jumped out of bed thought it would be for longer duration but it was just for 2-3secs and gone. 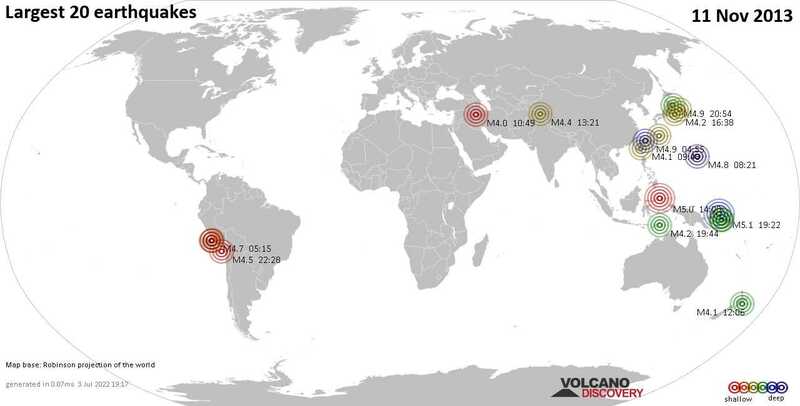 lodhi colony new delhi (4817.9 km E from epicenter) / MMI V (Moderate shaking): Lodhi Colony, New Delhi: heard quite a tremor as my bed rocked - 1:41 am IST. It was there for more than 1 sec, for sure. New Delhi India / MMI V (Moderate shaking): Around 1:45 AM I felt shaking of my Laptop and study table and heard sound from window panes. Left the house and came out in open space. palam,new delhi / MMI V (Moderate shaking): i am studying and felt earthquake 2 times.first,one is very slower but second one is very strong my fan,windows start shaking it is little bit scary. Mon, 11 Nov 16:16 UTC M 3.5 / 14.3 km - [info] (175 km) 111 km al O de San Juan. Mon, 11 Nov 12:38 UTC M 4.8 / 45 km - [info] (77 km) 4.8 BOUGAINVILLE REGION, P.N.G.